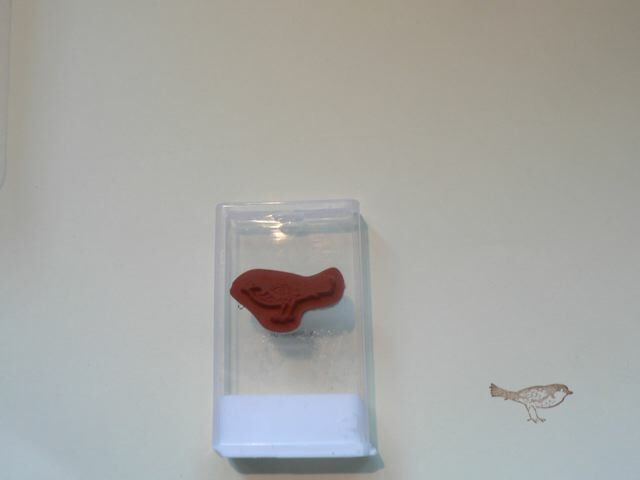 To be honest I am deep in my stash, preparing for my crop tomorrow, setting up page kits, etc., so not really much time to devote to either Intaglio play making printables, or proper crafting, but I did want to add this weird little thing in case anyone finds it useful. There are a few SU! stamps that I quite like, but to be honest the wooden blocks put me off. I haven’t had a look recently, but will surely ask my mate Laura who sells SU! stuff, and who gave me the set you will see here, if they now sells stamps with cling and no blocks. I could happen, you never know…So anyway, I was looking at the tiny little stamps and at the waste rubber that is left over after you push then out, and in one of those lightning strike moments I had an idea. Maybe not brilliant for anyone but me, but I found it solved a couple of problems. 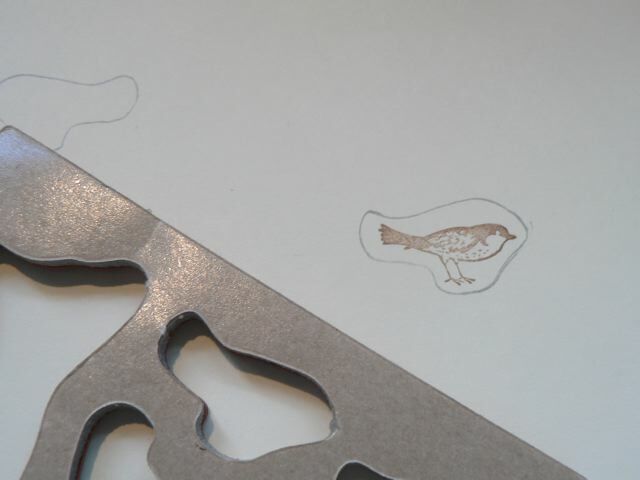 First, I was thinking about the stamps, and mounting them on something clear. I really wasn’t keen on spending a ton on a huge piece of perspex to chop up into mount size pieces (and to be fair it IS a bit thin) so I thought about what else might work. It had to be small, it had to be clear, and it had to have a bit of substance. My eye landed on a pack of Tic Tacs on the kitchen counter. Et viola! Perfect size, thick enough to handle and clear, and there you go! I could add the little sticker to the one side then looking thru the Tic Tac box, line up the stamp perfectly. 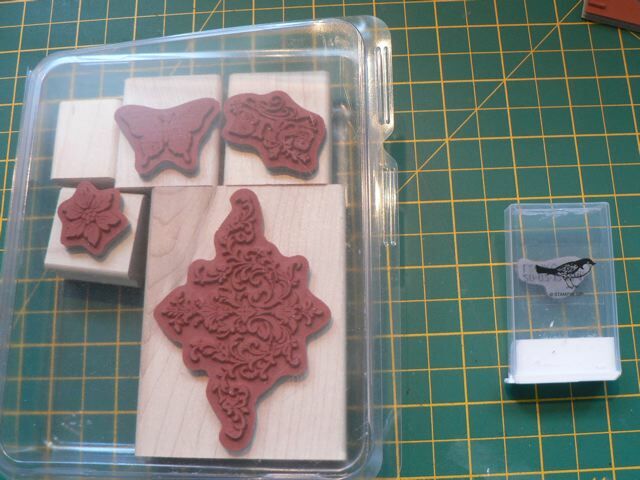 The small boxes are about 2 1/4″ x about 1 1/4″ so perfect for the smallest stamps. Any of the little ones in this set would fit, but not the big damask one, which is fine as that was already on the block when I got it. The bigger Tic Tac boxes are still to small for that, but they measure about 2 x 3″ of usable area (I would avoid the cap part as that is not see thru, but I guess as long as you can see the rest of the stamp, a little that you can’t see thru isn’t the end of the world) so they would take larger stamps. Ideally I would mount them on some sort of cling film, but as I didn’t have any, this worked well for me. I have a lot of older wood mounted stamps and small ones like this aren’t the issue storage-wise that huge honkin’ wood mounts are so I don’t even mind that is is on a mount, albeit a weird one. 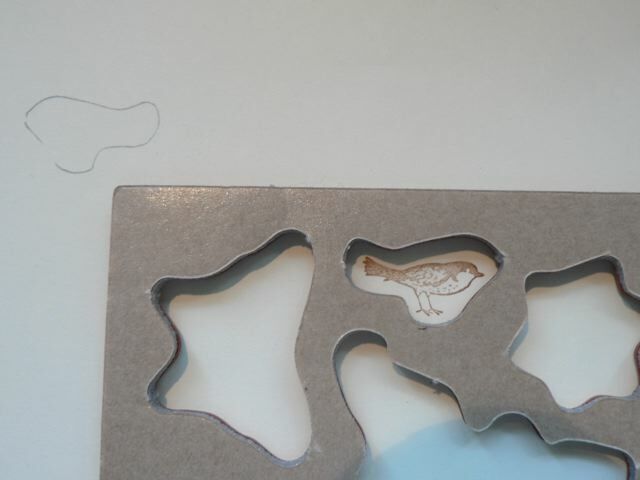 Now, if you read this blog regularly yu may remember I am fairly challenged when it comes to cutting out with a neat border. I can cut very nicely along a line, but to leave a uniform border all around an image, especially a decorative one. not so good. Looking at the waste rubber, it occurred to me that it makes a perfect mat bordered image. I demo it here with the bird, but honestly even I could probably cut that simple image nicely. I’m not so sure about the damask. I always go horribly wrong with those sorts. So what I did was stamped the image, laid the waste rubber over it, drew within the hole left by the stamp with a pencil, then cut just inside the line. 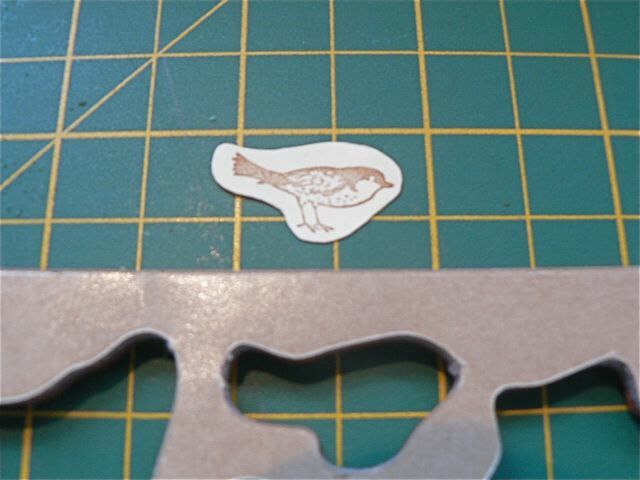 Then once you cut you get a nice border, although not a thin one on a small image like this one. It obviously depends on the look you want. For something like the damask this would give you a really symmetrical guide, and if you wanted it more closely trimmed you can still follow the outline, just cut further inside it. Those who are masters of the cutting out will scoff at this but honestly it helps me so much to have that visual symmetry drawn on rather than trusting my eye. Back to the kit making and then off to see GLEE, the movie, with DD. Have a great day! SU has been selling unmounted stamps for about a year now. They are quite a bit cheaper. Npt quite every set is sold clear mount, but all the new stuff I believe. Have a great day yourself..couple of really good ideas here – but for me, the wood mounts still have it! Am about to start the kitting process …..you are not alone. Enjoy Glee!